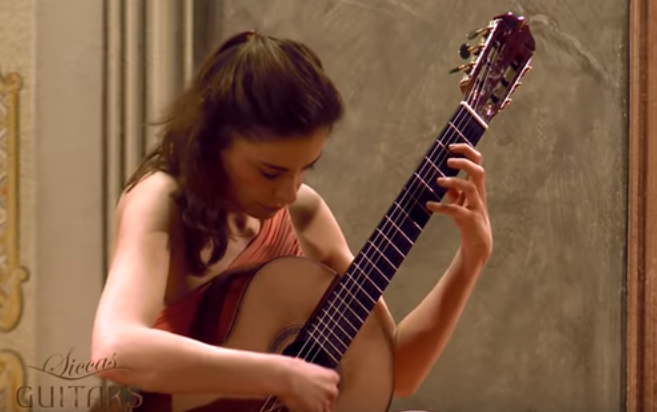 Ana Vidovic is a classical guitarist from Croatia. Goo gull seems to auto delete one embedded video if i try to post two in the same post. Here is the missing video: classical guitar Ana Vidovic . A child prodigy, Ana started playing guitar at the age of five, inspired by her brother Viktor. She is also the sister of concert pianist Silvije Vidovic. Her father was an electric guitar player. She began performing at the age of 8 and by the age of 11 she was performing internationally, and at 13 became the youngest student to attend the prestigious Academy of Music in Zagreb where she studied with Professor Istvan Romer. Vidović's reputation in Europe led to an invitation to study at the Peabody Conservatory in Baltimore, U.S., with Manuel Barrueco, from where she graduated in May 2005. She has lived in the United States since, where she also works as a private tutor. Vidović plays a Jim Redgate guitar exclusively and has said, "When I got it and began to play, I immediately knew that this was the instrument that I want to be playing for a long time." She has released 6 CDs published by Croatia Records, BGS, and Naxos and has released two DVDs published by Mel Bay publications. Vidović has won an impressive number of prizes and international competitions all over the world. These include first prizes in the Albert Augustine International Competition in Bath, Somerset, England, the Fernando Sor competition in Rome, Italy, and the Francisco Tárrega competition in Benicasim, Spain.